Narrow aisle systems incorporate selective rack but in a much tighter layout out. They have the performance characteristics of multi-position racking and can reach heights greater than 30 feet and are freestanding. Reduced requirements for working aisles and extremely high lift heights are their distinguishing features. 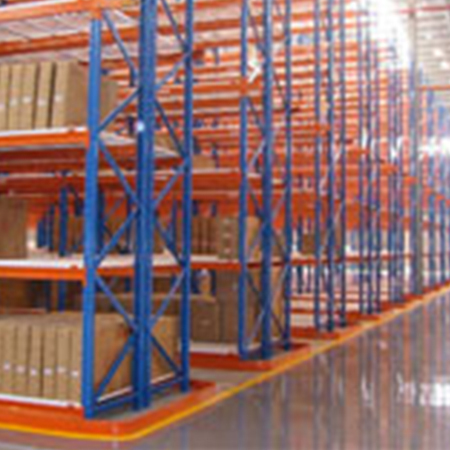 Narrow aisle systems are used specifically where the customers space is limited and it is necessary to increase throughput compared with multi-position racking They are not a permanent part of the building and thus extremely adaptable during possible re-organization. To operate in a VNA system reach-trucks are typically outfitted with a wire guided system. This entails a wire to be embedded in the concrete that the reach-truck uses for guidance. There is another alternative to a wire guided system and that and that is a rail guided system. A rail guided system uses angle iron bolted to the floor around the rack to guide the reach truck through the system with out damaging the rack.